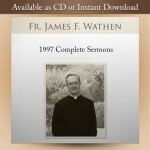 By popular request, we have made it so you can now purchase entire years-worth of Father’s sermons in a single product. In the beginning of each yearly category, there is a product listing for the entire set, and priced accordingly, so it makes sense economically to buy the set as a whole. If we add new sermons to any year, we will automatically add it to the set as well, and update the information. 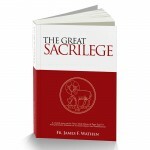 We have also combined every set into one super-set of all of Father’s audio sermons and lectures, which can be found at the front of any category. Thank you to all those who have showed support for the Foundation. You are helping us to promote Father Wathen and his apostolate, and we could not continue without our loyal patrons.